“Gear effect,” “limited dispersion,” “tracking line” … all figure into a putt’s behavior after the strike, but you’ve got to be lined up properly before pulling the trigger to eliminate as many hole-seeking bugaboos as possible. 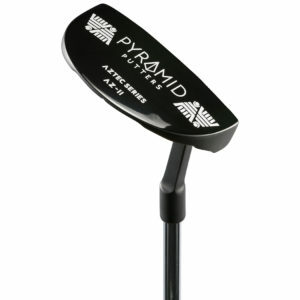 That’s what the CNC-milled, 431 cast stainless-steel Pyramid Putter purports to do with its blend of geometrically-placed elements on the top and face that are, as you’d expect, based on the pyramid shape. First is the top-line alignment system that marries a straight line along either the blade or mallet’s flange with another, fainter center line from which 45-degree-angled lines fan out on both sides; once those are in perfect alignment you’ll know your eyes are centered directly over the ball and you’re good to start the stroke. That’s where the second set of “lines” come in, in the form of grooves cut into the putter face — horizontal ones forming a pyramid down the center, with diagonal grooves on each side of that pyramid designed to keep the ball moving “end over end” even on toe or heel strikes. The result is one solid putt after another, excellent distance control and more confidence overall, a true plus for those of us battling the dreaded yips now and again. A Golf Tips editor tested the wand at a mountain course in northern California with greens running about 10.5 on the Stimpmeter, logging one of his best putting rounds in months including several buried middle-distance efforts for par or birdie. “We just wanted golfers to be more comfortable at set-up,” said Colin Callahan, one of Pyramid’s three Colorado-based founders. “So you can set up with a little less stress, knowing you’re on the right target line.” The shaft bend between models varies a bit, with the AZ-2 mallet (which Golf Tips tested) offering a half-shaft offset plumber’s neck and the AZ-1 blade with a full-shaft offset. “If you have an inside-to-out stroke pattern, you’ll probably gravitate to the blade,” Callahan said. 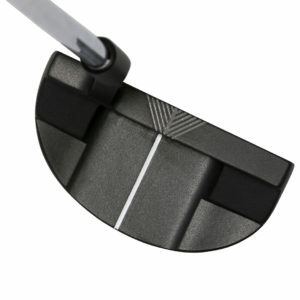 “If you’re more of a straight back-and-through putter, it’s the mallet.” The grip is unique, too, with consistent diameter and a nice tacky feel thanks to silicon dots.